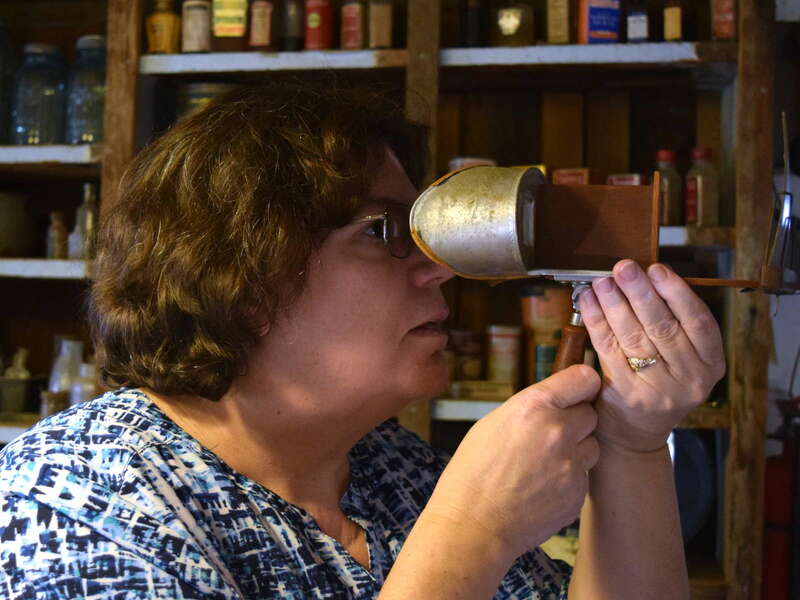 Karen looks through an old stereoptican with some local images at the Raymond Museum. 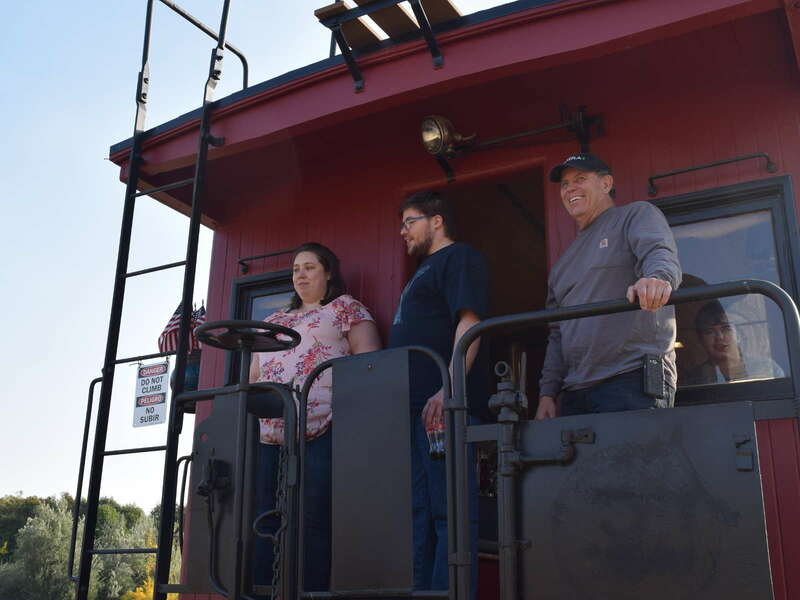 Erin, Tom, and Andy (and Danny in the window) look out at the view from the caboose in the front of the Raymond Museum. 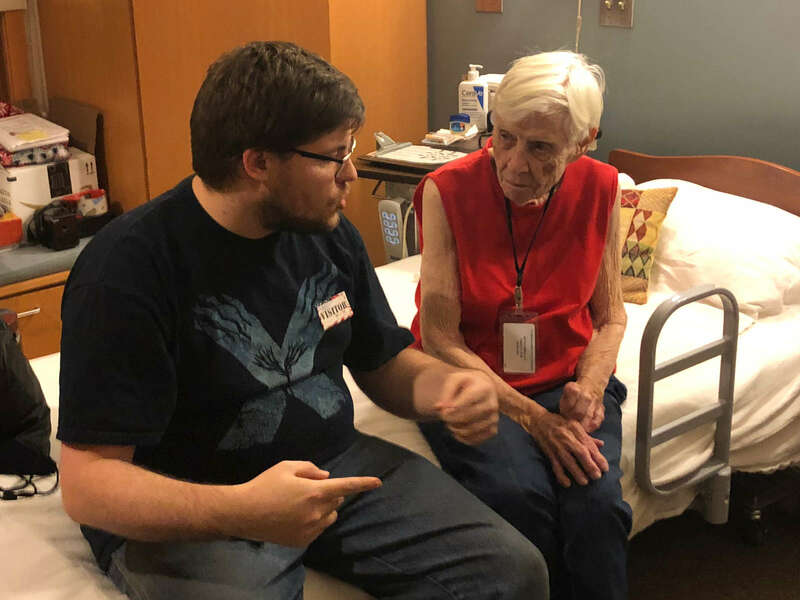 Tom explains his job in a textile factory to his Nana. 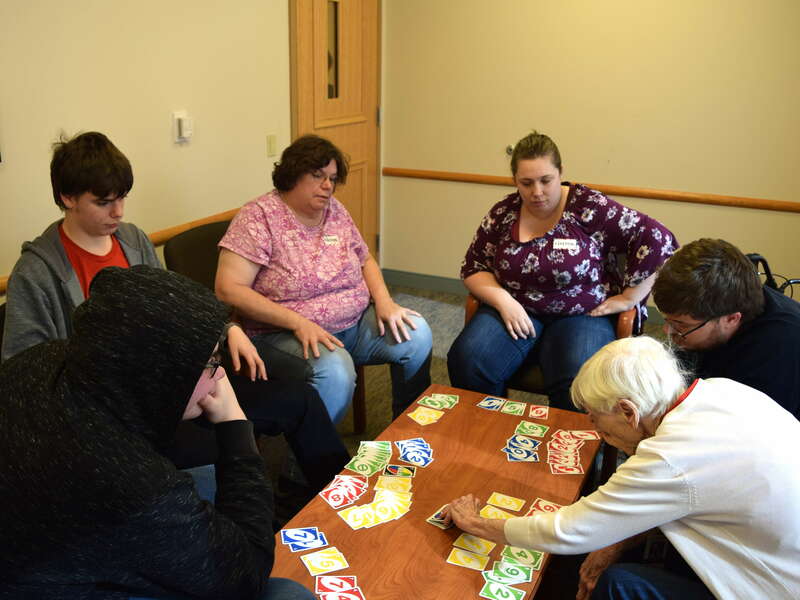 Our Uno game, with seven players, lasted so long that we had to move it to a conference room so that the residents at the Cal Vet home could have their lunch. 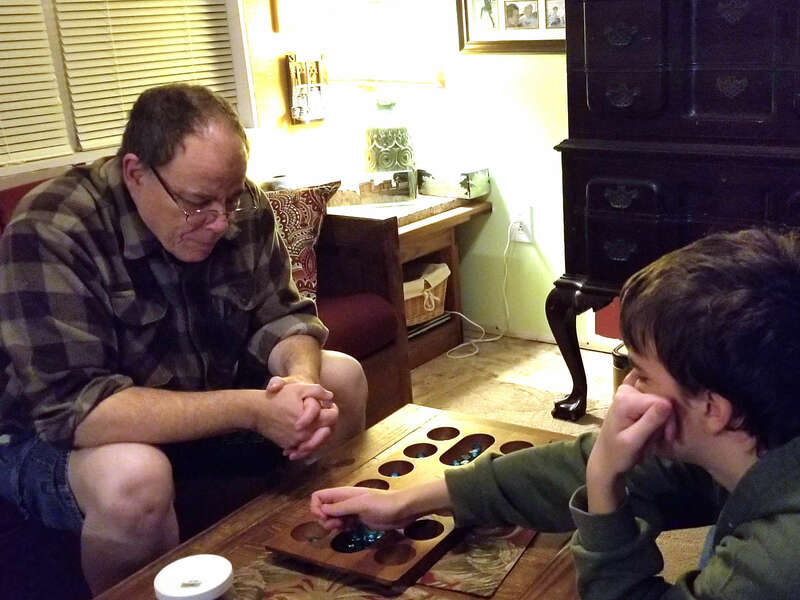 William and Daniel enjoy a game of Uno with the rest of the family in California. 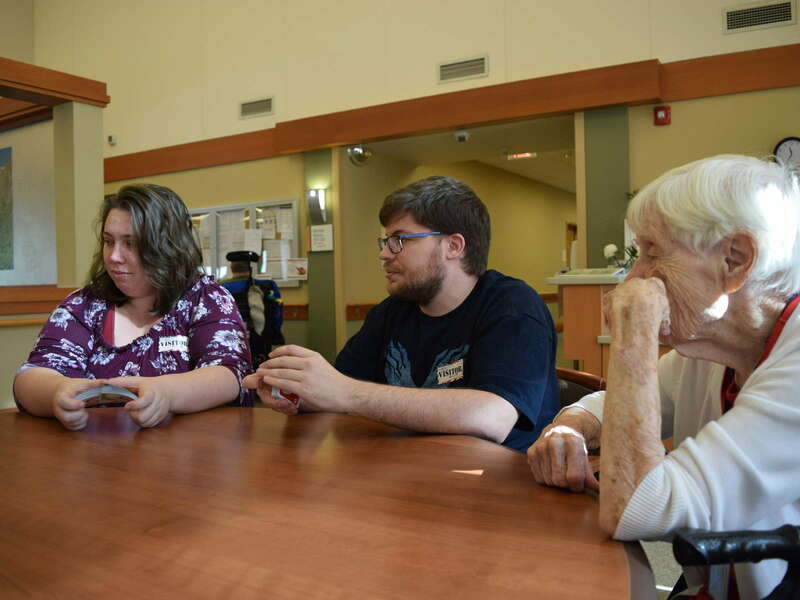 Erin and Tom play a game of Uno with Nana. 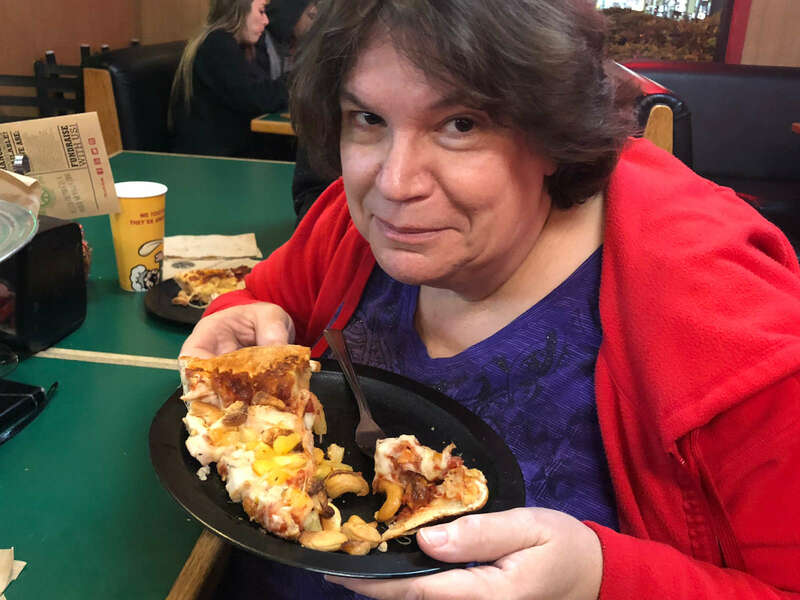 Karen enjoys an old favorite treat from the Pizza Factory: a pizza with chicken, pineapple, and cashews. 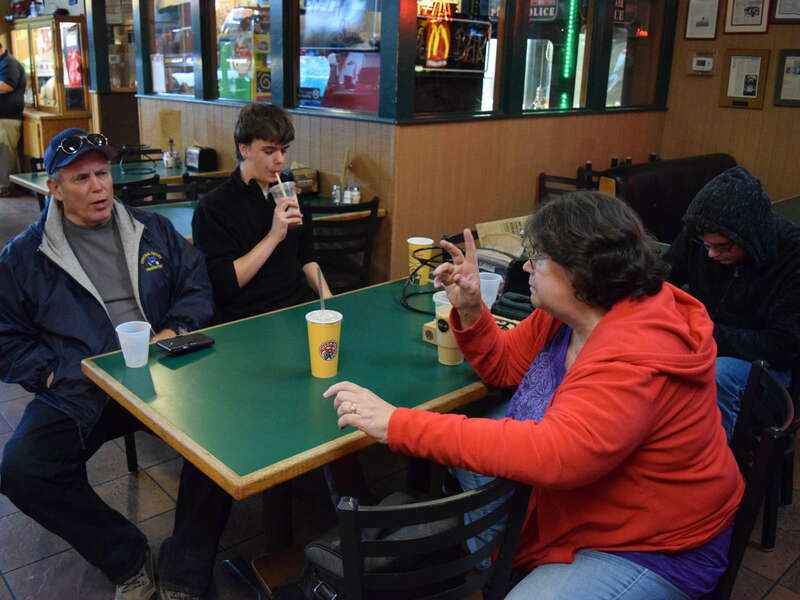 Karen, Danny, and William visit with Andy at the Pizza Factory in Oakhurst. 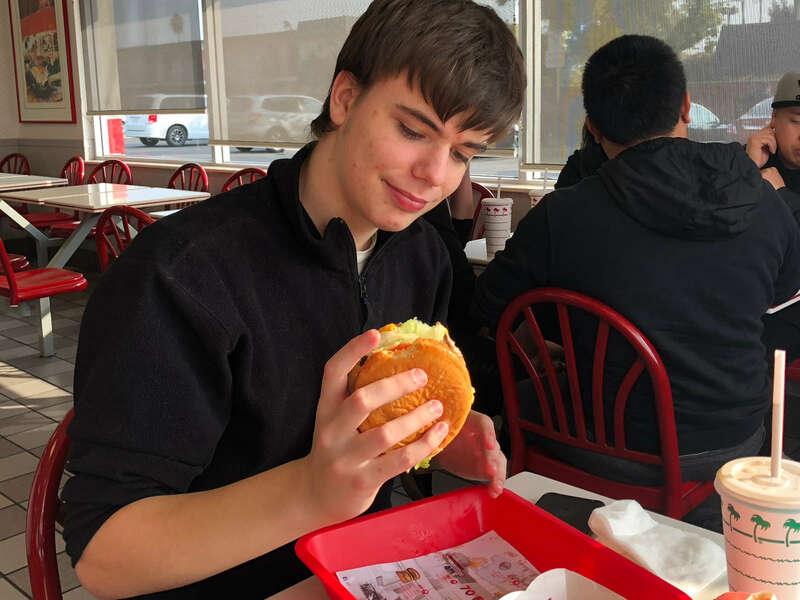 Daniel getting ready to try his very first In 'N' Out Burger. He loved it, and wishes they's open one in New Hampshire. Daniel was using a game on his tablet to design a plane. 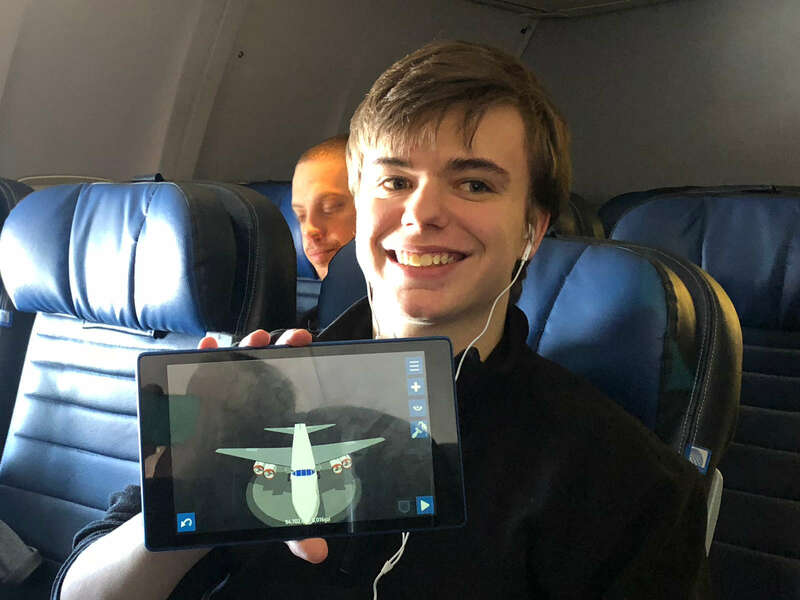 While he was flying on a plane. 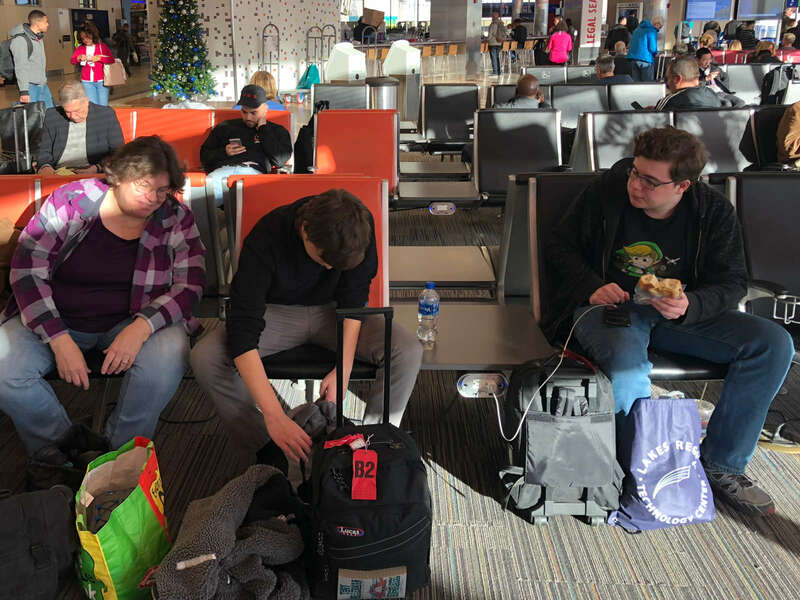 Karen, Danny, and William waiting at Logan airport to take off for Los Angeles. 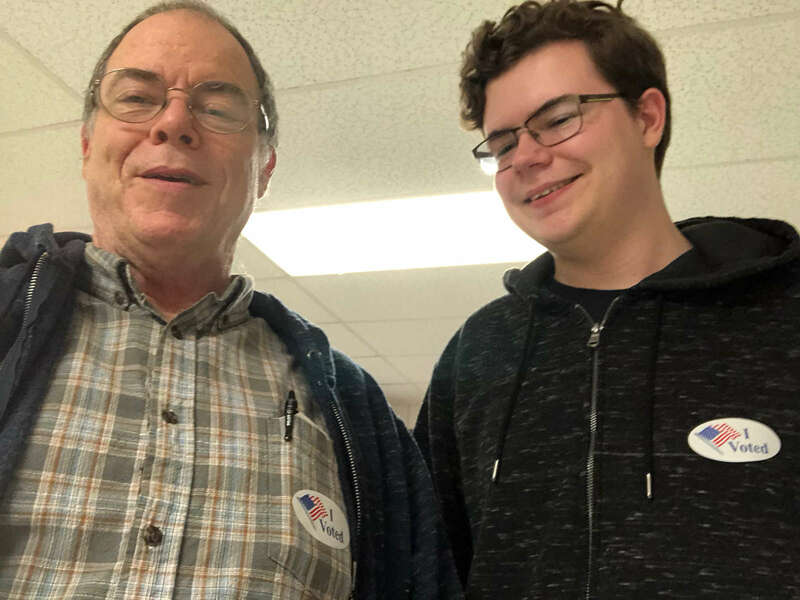 Gordon and William went to the polls together after Gordon finished work. Even with about an hour to go until closing, the polling place in our little town was bustling. 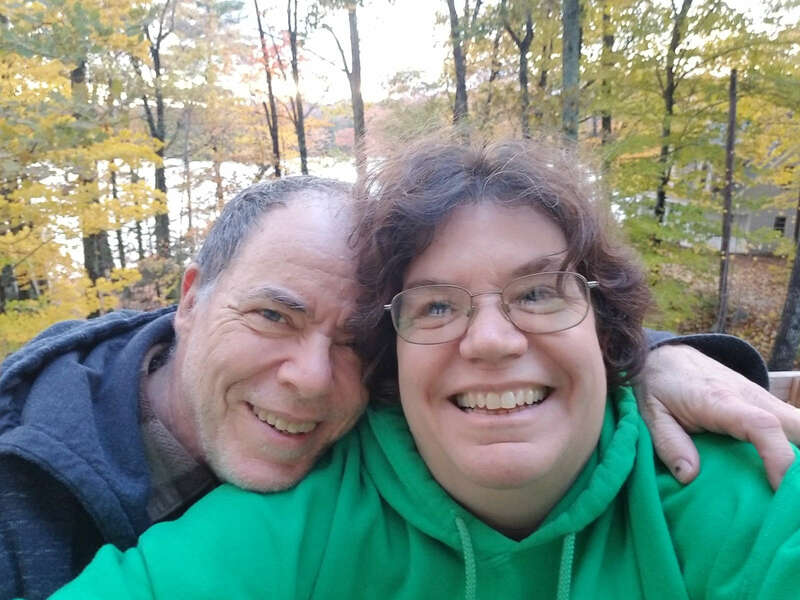 Karen and Gordon grab a selfie on the back deck, against a background of the last gasps of fall color. 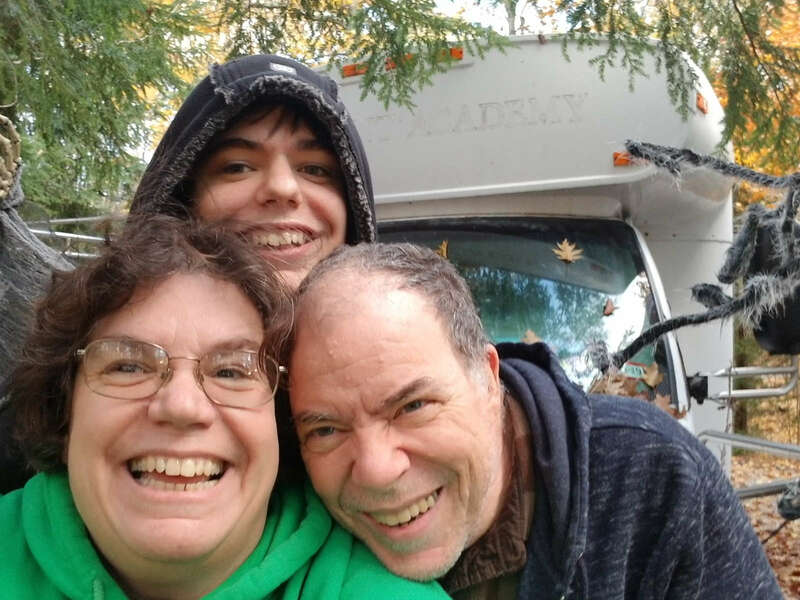 Karen, Danny, and Gordon with Gypsy the Bus. 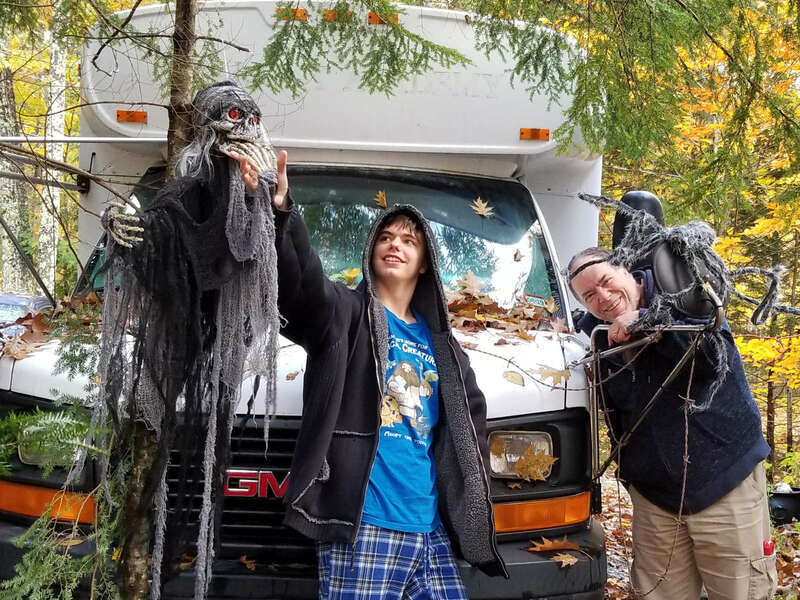 Danny and Gordon pose with a leafy and slightly decorated Gypsy the Bus before the Halloween decorations come down. 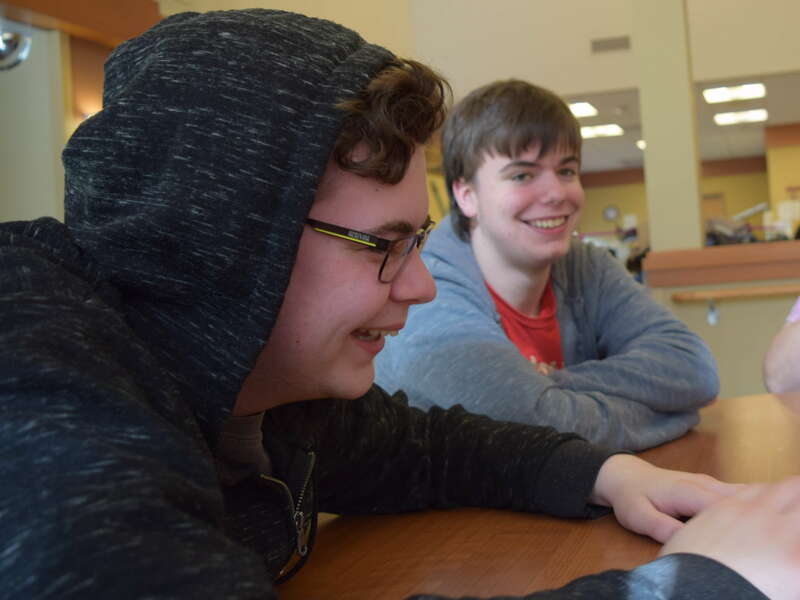 Gordon and Danny play Kalaha, a game that Gordon used to play all the time in middle school. 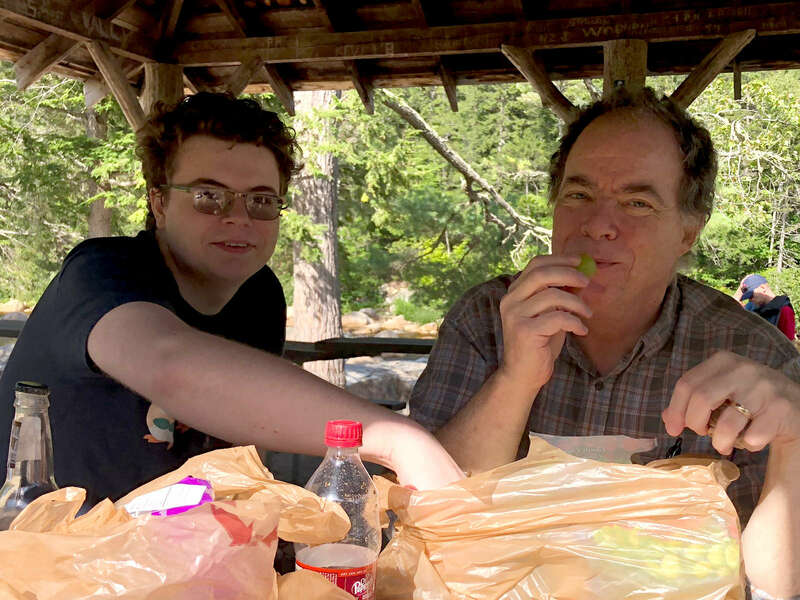 Yes, Gordon is wearing shorts; it was warm enough on that one day. 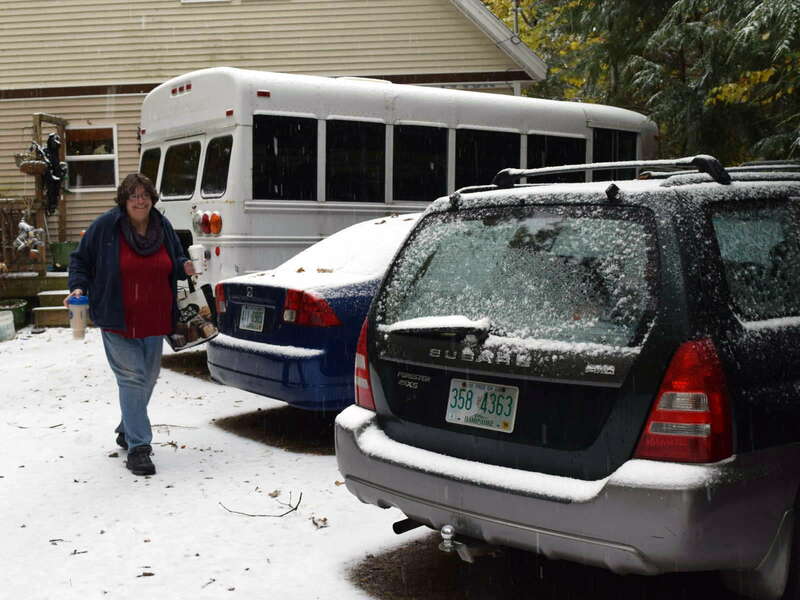 Karen walks out to the car to go to work on an annoyingly snowy morning in October. After the snow, it rained in the afternoon. 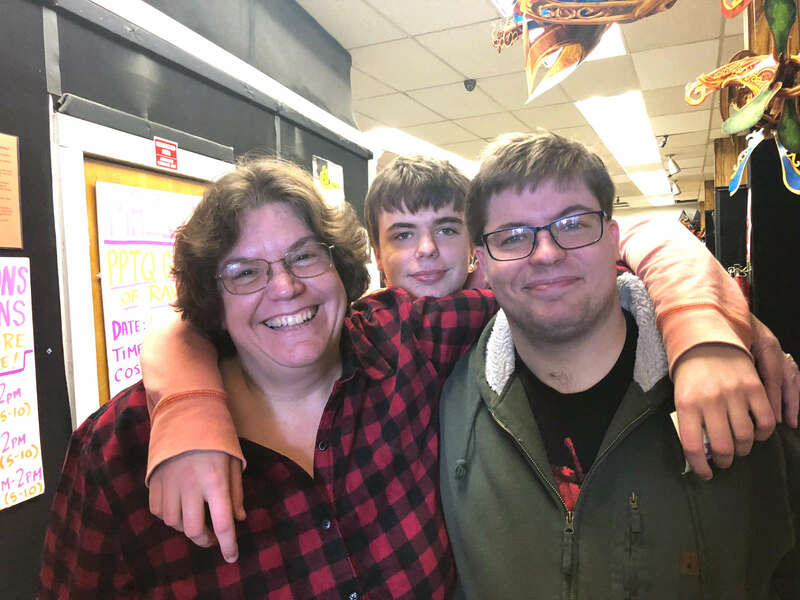 Karen, Danny, and Thomas at a comic book store where Tom and Danny attended a prerelease party for new Pokemon cards. 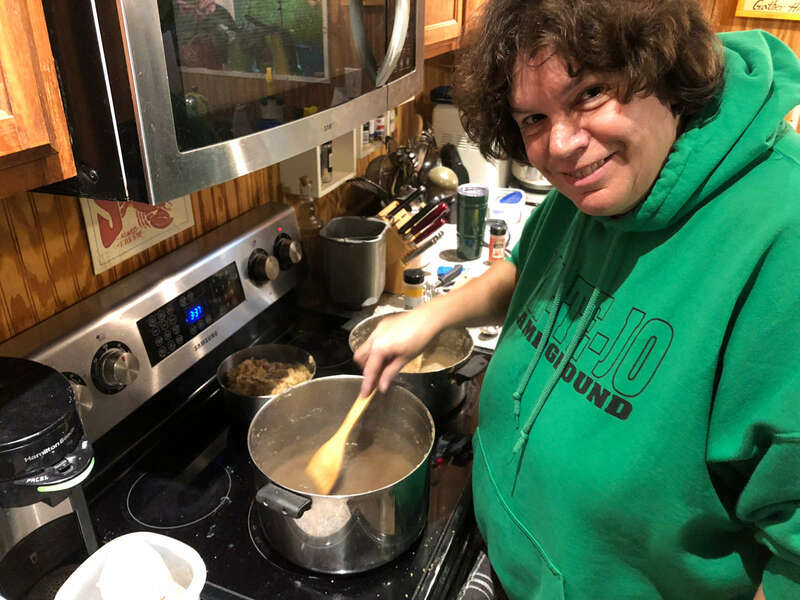 Karen cooks down some crabapples to use later for apple butter and apple sweetbreads. 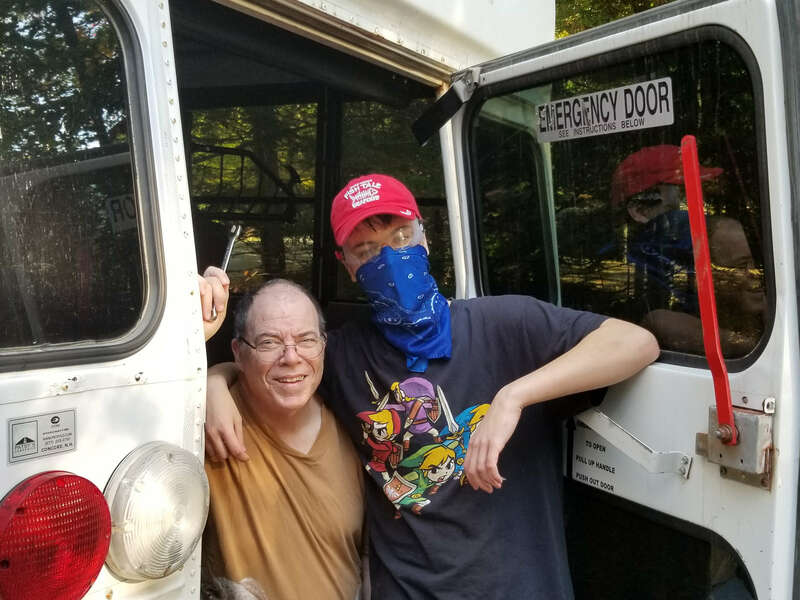 Gordon and Danny, Danny equipped with mask and goggles to keep rust from getting in his mouth and eyes, worked together to remove the seat in the back of the bus. 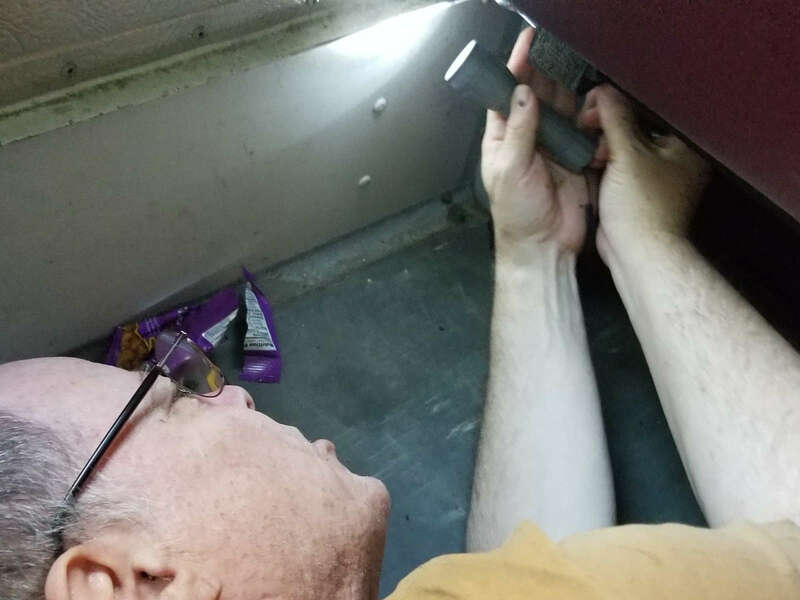 Gordon tries to figure out the bracket under one of the seats that holds the bus's rear heater. He wants to remove the seat but keep the heater intact. 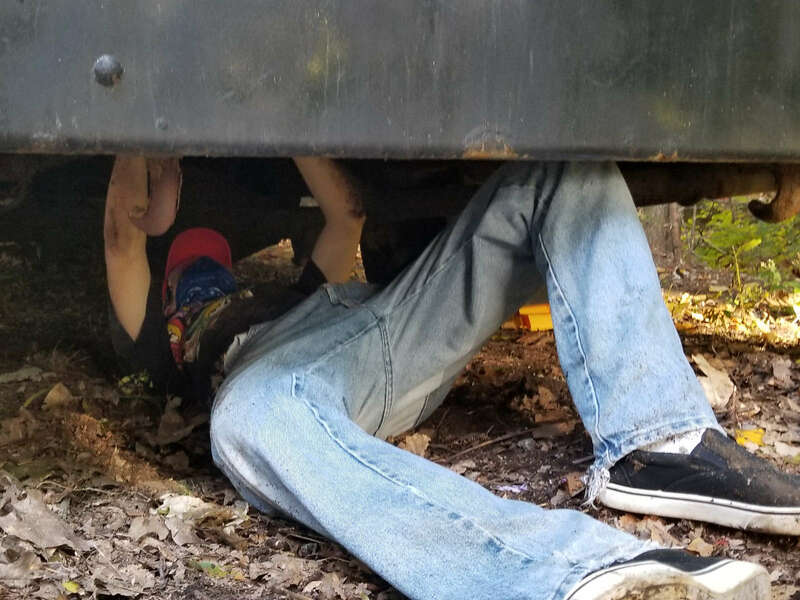 Gordon threw Danny under the bus, so that Danny could hold a wrench on a nut while Gordon loosened the bolt from inside the bus. Most of the seats have to come out for the camper conversion. 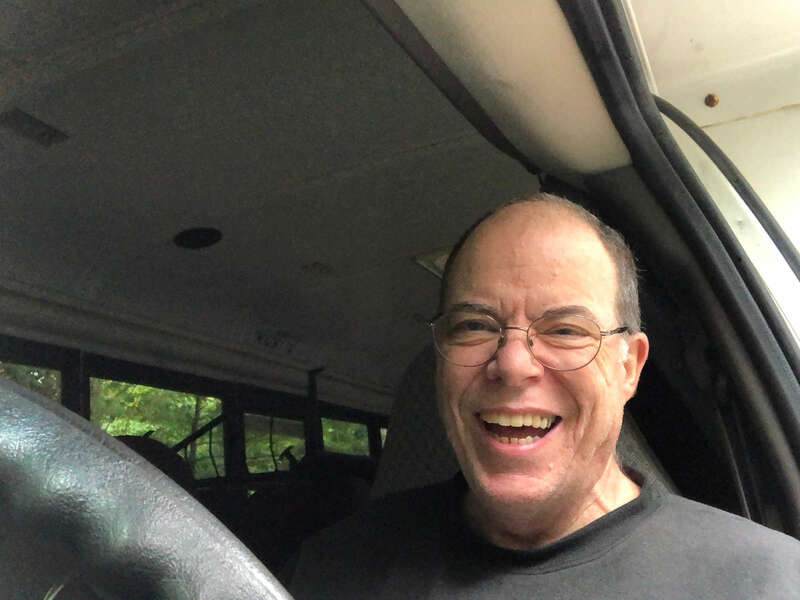 Gordon sits in the cockpit of the bus. 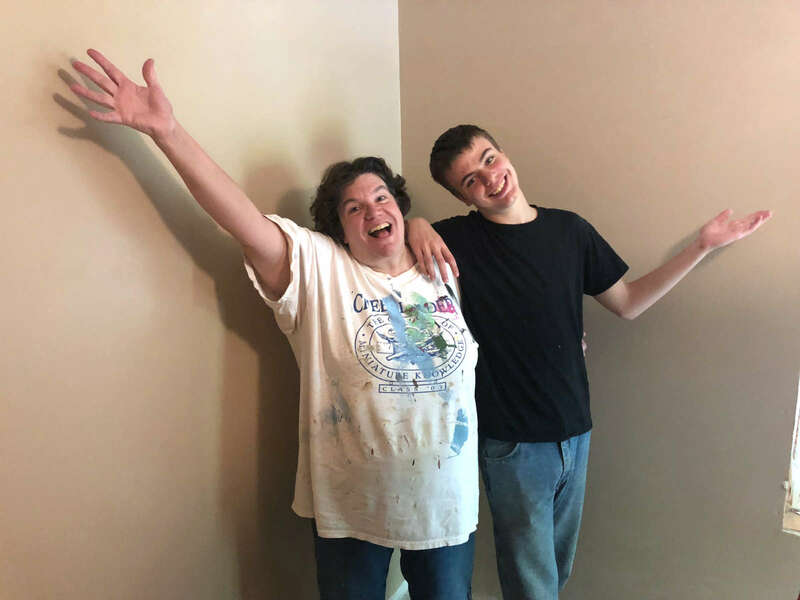 He's been working to try to remove the things inside the bus, like extra seats and racks, that we won't need for the camper. Weather has been slowing that down a bit. Karen fries battered apple rings made from crabapples. 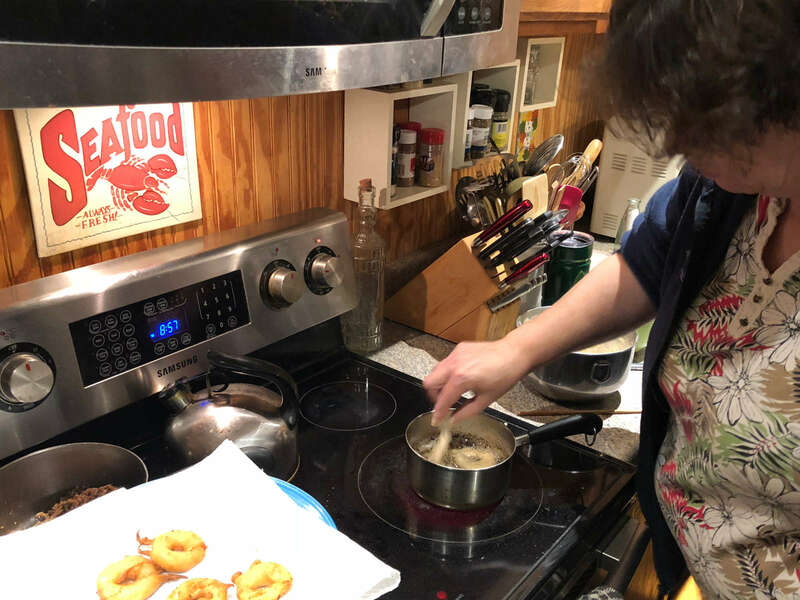 The apples softened during cooking and the result was almost like a very tangy apple-filled doughnut. 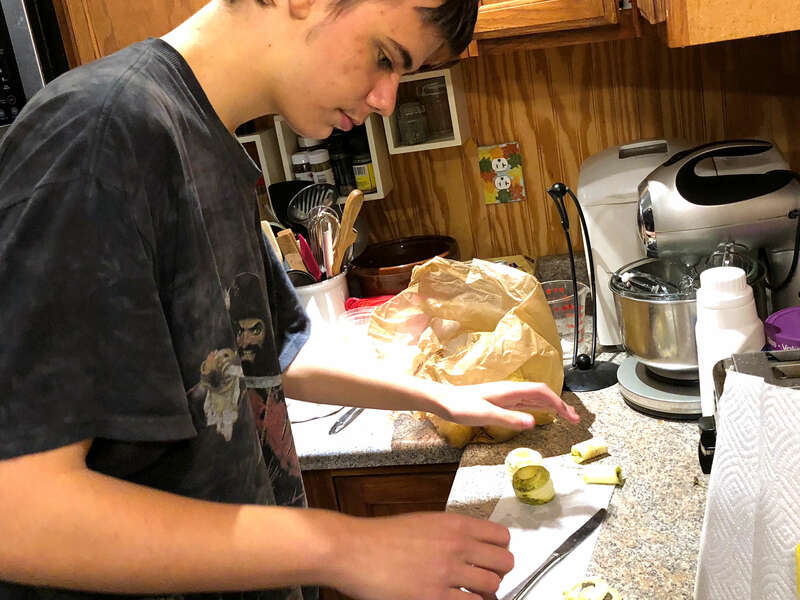 Danny slices some crabapples on our corer/slicer for Karen to use making fried apple rings. 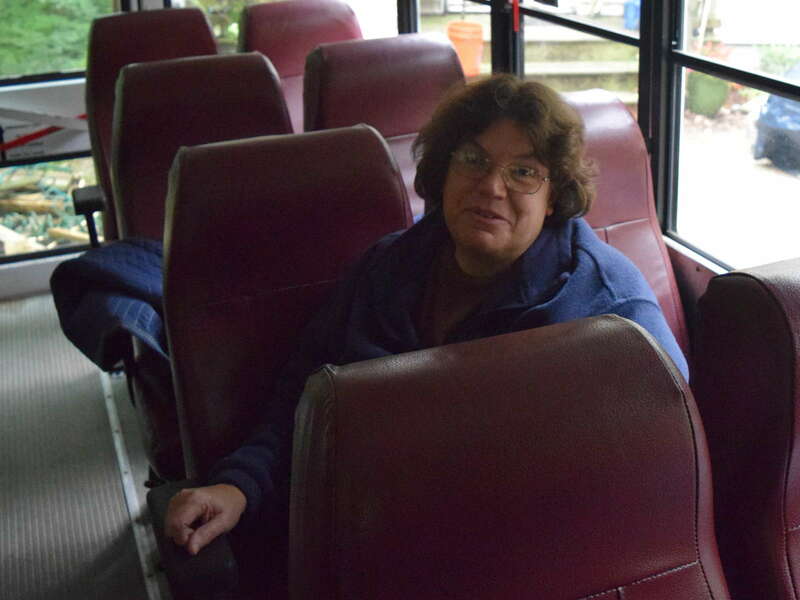 Karen sits in the bus, contemplating possibilities for the interior. Most of the seats are getting taken out, as are the overhead racks. 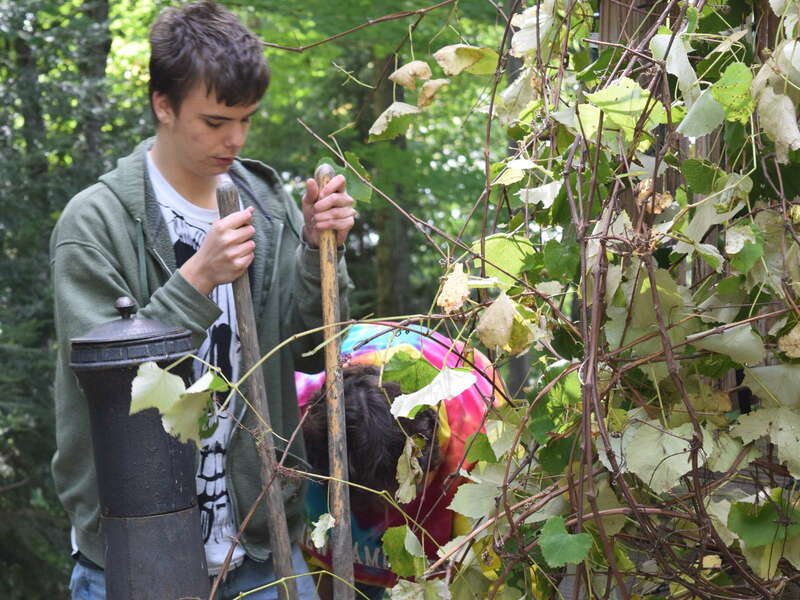 Danny digs a hole for the grape vine, which we had to move to make room in the front yard for the bus. 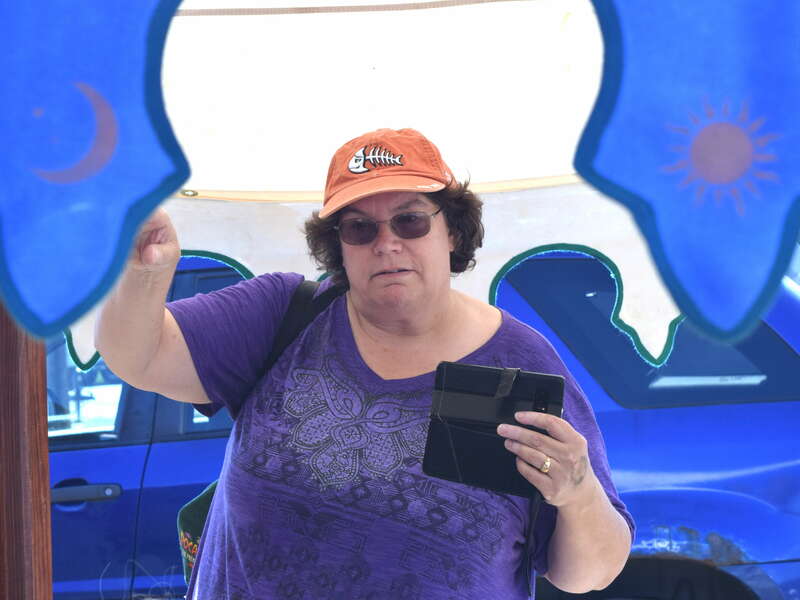 Karen talks to the owners of a gypsy-wagon-style trailer about their wonderful canopy. 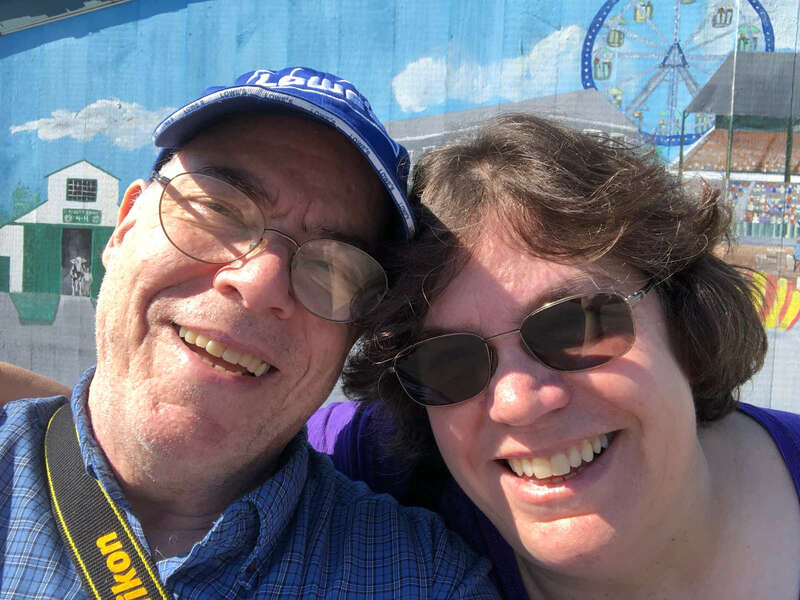 Gordon and Karen grab a quick selfie at the entrance to Marshfield Fairgrounds where they attended a tiny house festival. 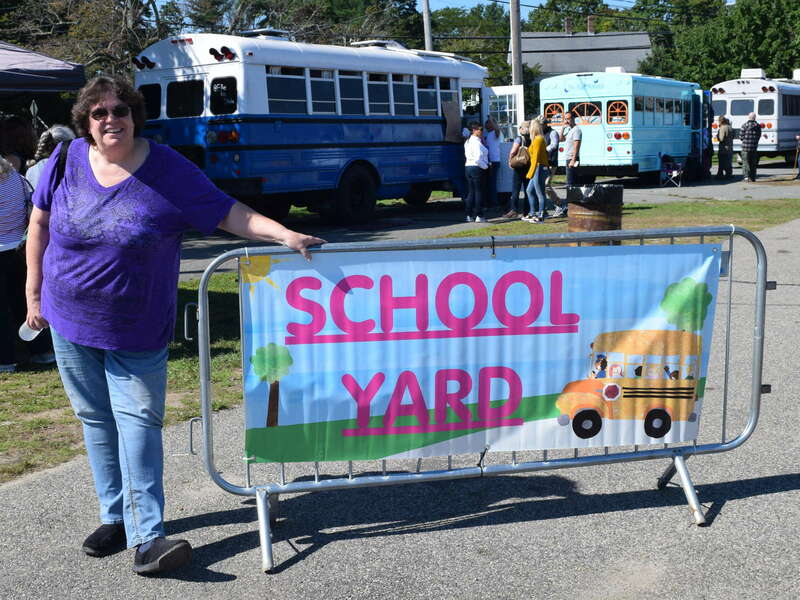 Karen gets ready to go look at some skoolies at the Massachusetts Tiny House Festival. 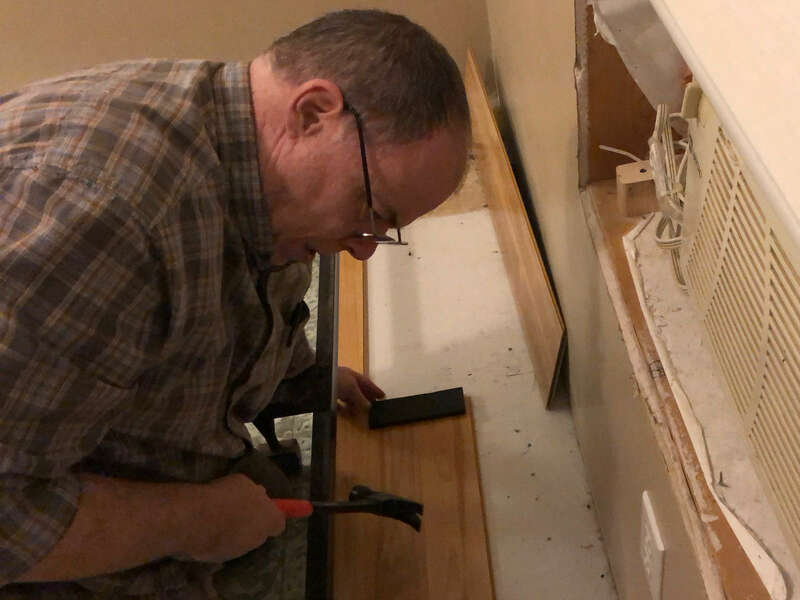 Gordon taps a plank of Pergo flooring into place in the bedroom. 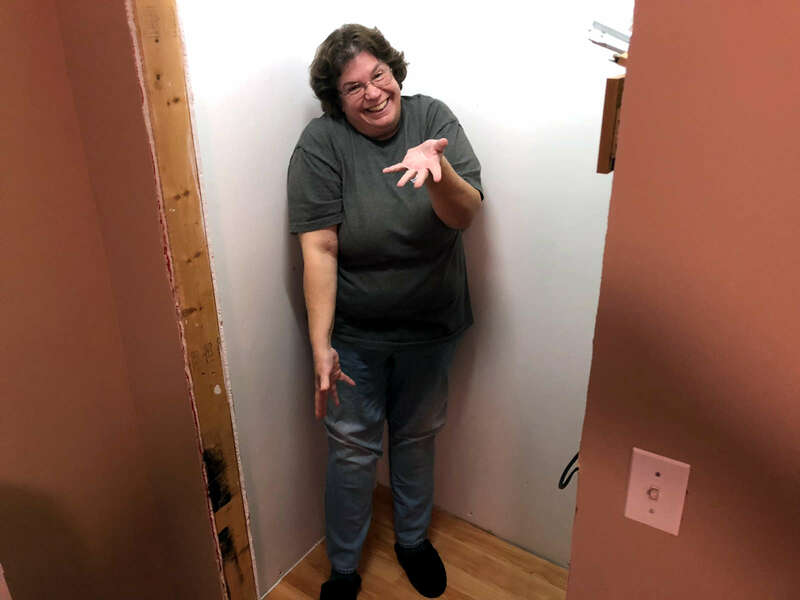 Karen showing off our closet, which may not look like much (yet), but with the floor in we can start putting the fixtures in and have a real closet for the first time since we moved into the house. 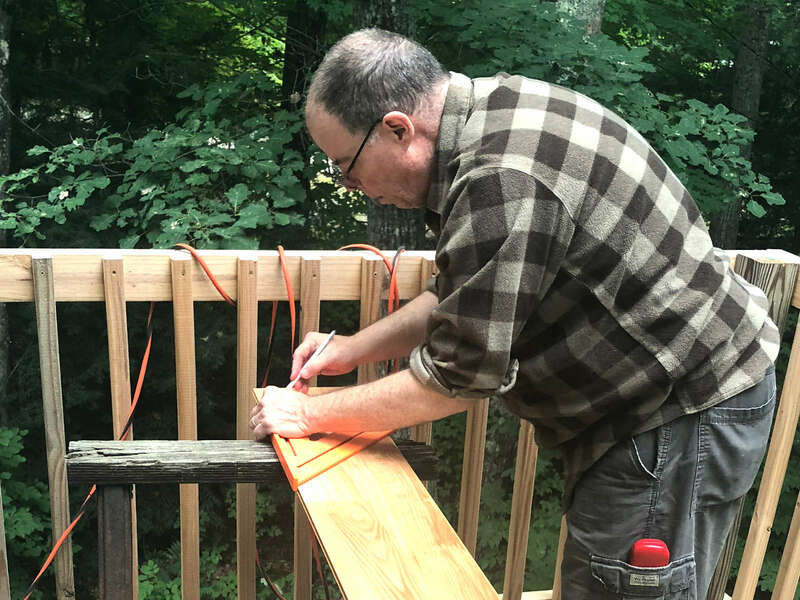 Gordon marks off the length of a stick of Pergo flooring for his and Karen's bedroom. 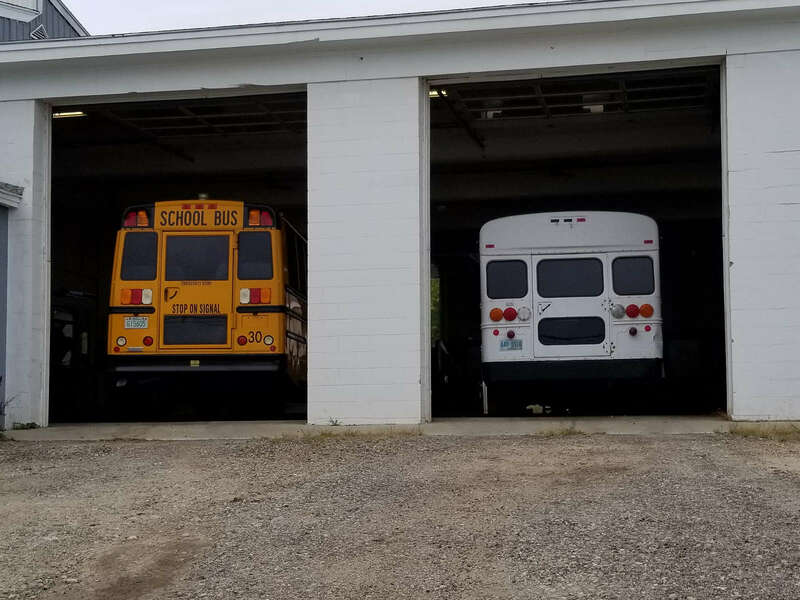 Our little bus looks a lot less intimidating next to a full-sized school bus. The soon-to-be skoolie is in for a few repairs to get it through state inspection. We'll have it home to start tearing out seat for the conversion soon. 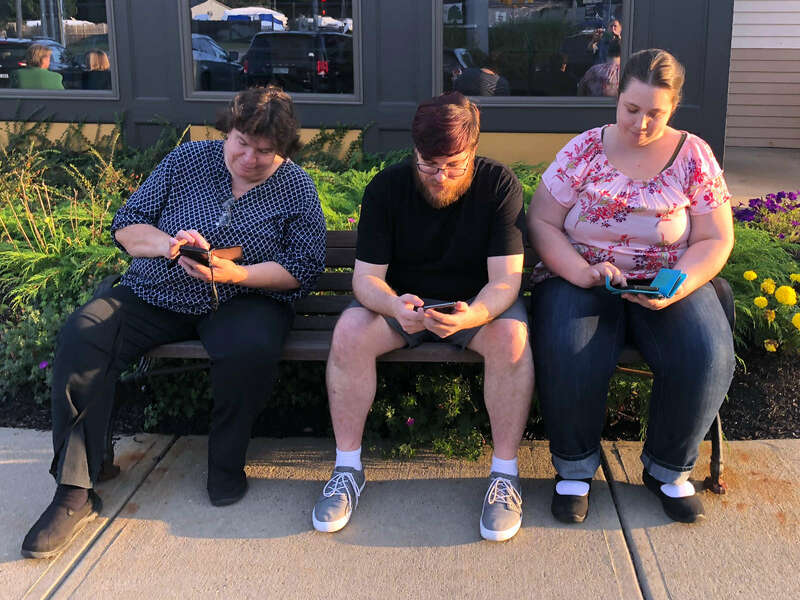 Waiting for a table at the restaurant, 21-Century version. Karen, Tom, and Erin only look as though they are ignoring each other; they're actually finding things to share. 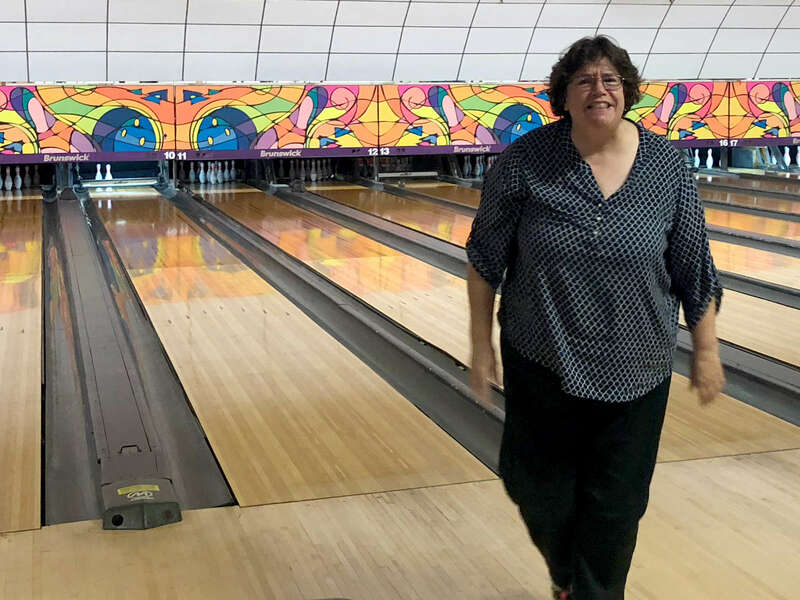 Karen threw what looked like a perfect strike ball, but two pins had other ideas. She was robbed! 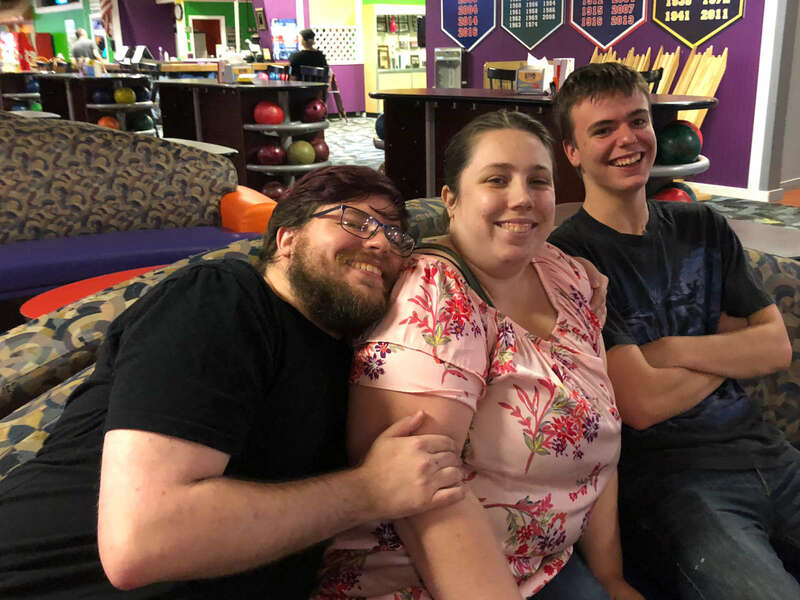 Thomas, Erin, and Danny have a little fun on the bench at the bowling alley. 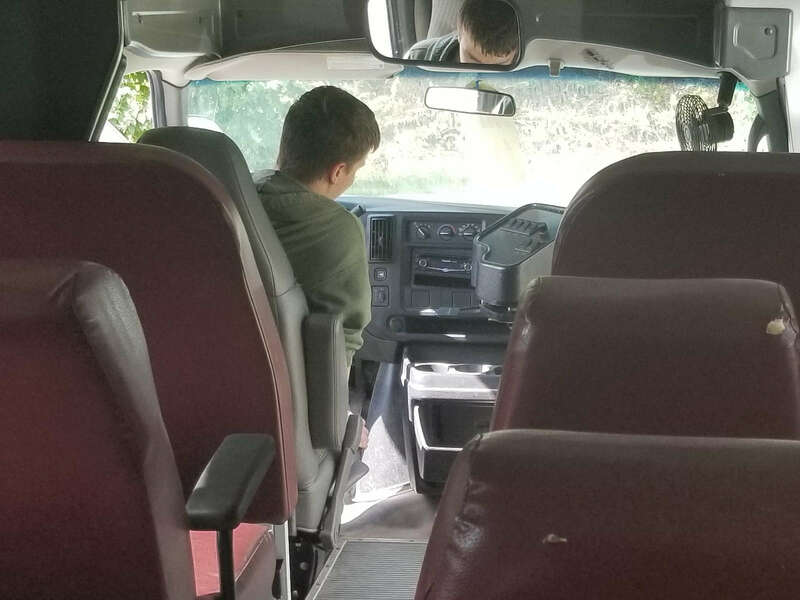 Danny sitting in the cockpit of the bus that Karen bought. 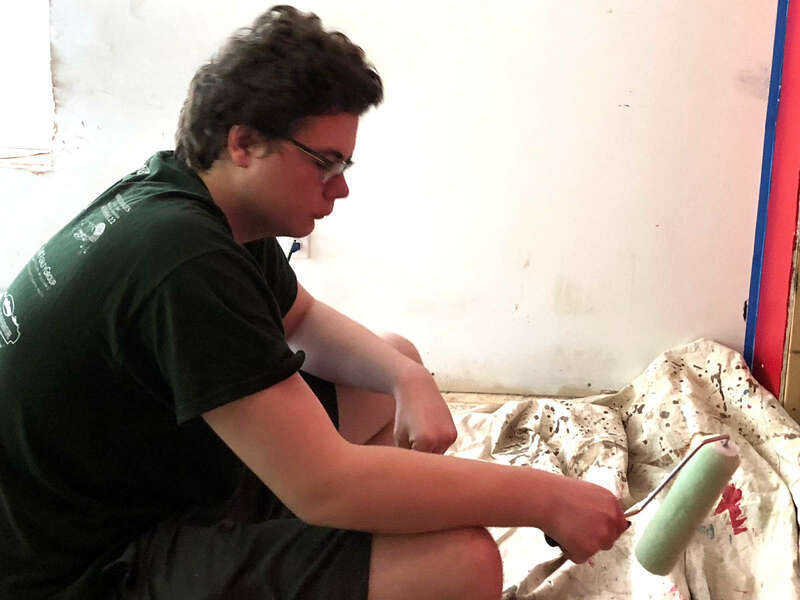 Not old enough to drive it yet (whew!) but still interested. 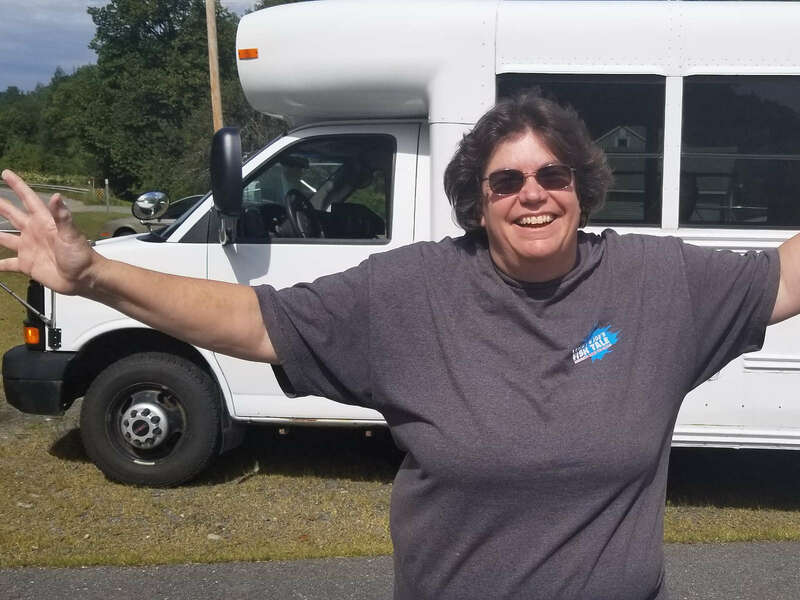 Karen standing in front of the bus she just bought! This bus will be our new camper soon. 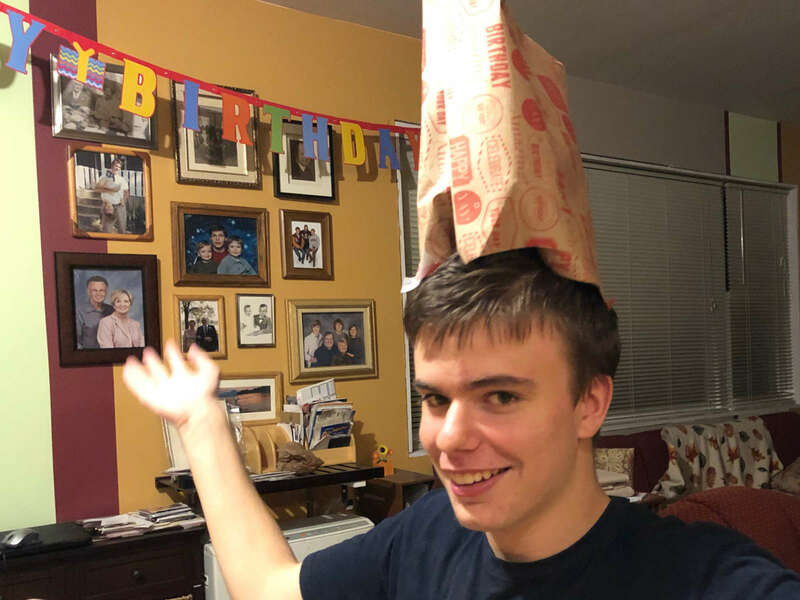 Danny decided that the wrapping paper from one of Karen's birthday presents would make a great hat. 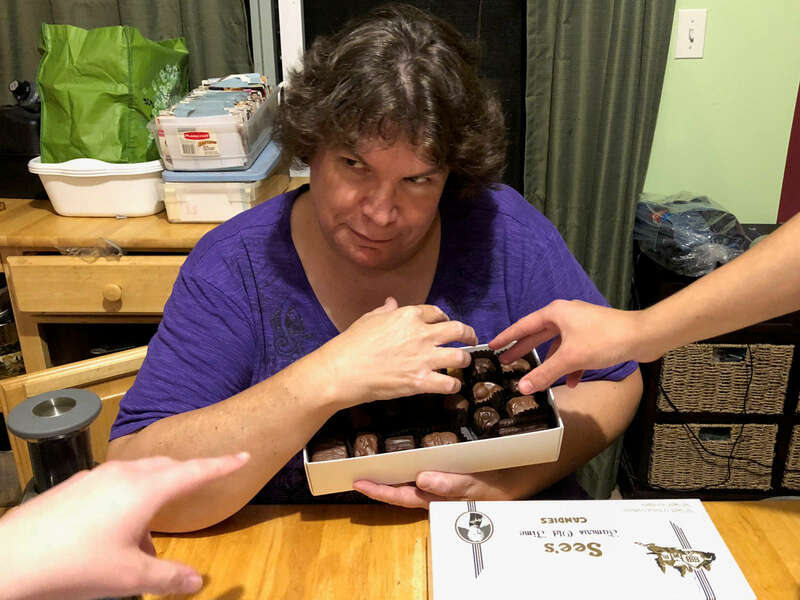 Karen protects her precious See's chocolate from prying hands.